I first came across the L.A. duo Kisses on the CMJ Mixtape series, a free monthly downloadable compilation, which always manages to open my eyes and ears to a few cool new bands. As a big 80’s pop fan and the proud owner of a Roland Juno 106 analog synthesizer, I was instantly intrigued by their lush synths and reverberant, moody beats reminiscent of New Order or even Bronski Beat, perhaps with a dash of Modern English. 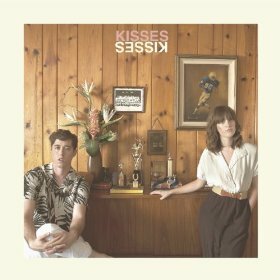 Kisses’ latest album, Kids In L.A., is bursting with a stark and riveting freshness. The songs are catchy and transparent, leaving space for every element. So much of the indie electro pop out there nowadays is filled with layer after layer of often generic synths, and so washed in reverb, that it starts to lose its impact. But Kisses knows how to do it right. “Huddle” is a sort of call-and-response between vocals and synths, tied together with minimal effects and instrumentation. “Funny Heartbeat” is a sweet and sad ballad with a refreshingly upbeat chorus and loose, funky guitars. The last track, “Adjust Glasses,” could easily become the indie pop scene’s answer to OMD’s “If You Leave,” with Zinzi Edmundson’s breathy vocals and the synth solo we’ve been waiting for since 1987. This album, in short, is a glorious throwback to happier times in a way that is bold and new, for they are not afraid to be dark and gloomy despite wanting nothing more than to make you dance. I highly recommend it as a companion to walking alone on the beach at sunset or lying by the pool this summer.